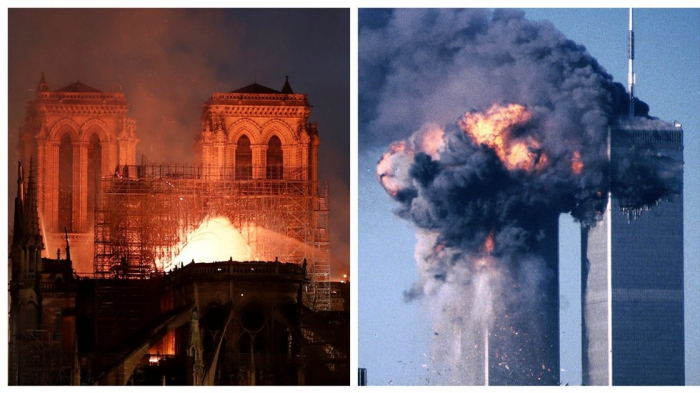 YouTube’s “conspiracy filter” algorithm accidentally tagged livestreams of the Notre Dame Cathedral fire with an “info box” displaying a blurb about the 9/11 attacks, proving its AI isn’t very intelligent after all. France24 and other agencies running livestreams of the blaze found YouTube had placed the offending conspiracy disclaimer below their videos, featuring a brief summary of the “official version” of the events of September 11, 2001 taken from the Encyclopedia Britannica. Unfortunately, the information was about two decades – and an entire continent – off the mark. YouTube claims to show “tens of millions” of anti-conspiracy text boxes to viewers every week, pulling text from sources reputable (Britannica) and not-so-reputable (Wikipedia) in an effort to debunk so-called conspiracy theories. The platform stepped up efforts to “reduce recommendations of borderline content and content that could misinform users in harmful ways” (such as “making blatantly false claims about historic events like 9/11”) earlier this year, but claimed the measure would apply to less than one percent of all YouTube videos. As some astute Twitter users pointed out, the feature designed to squelch conspiracy theories was actually promoting them by suggesting there was a link between the events of 9/11 and the cathedral fire.